A Ghost in the Glamour is a collection of short stories and a stand-alone novella in an exciting paranormal mystery series by Elizabeth Hunter, author of the Elemental Mysteries and the Irin Chronicles. Contains mature themes. Linx Maxwell is on the verge of greatness. She's finally graduated from street fairs and hopping chain-link to making art that pays the bills. Her family life is . . . not dull. And it looks like her van might just be able to exist on hope and duct tape. If only she could get rid of the ghost who's plagued her since the eighth grade. Frank doesn't like his afterlife any more than Linx does. He just doesn't know how to leave. 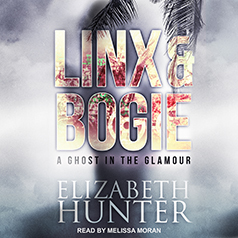 A Ghost in the Glamour is a collection of short stories and a stand-alone novella in an exciting paranormal mystery series by Elizabeth Hunter, author of the Elemental Mysteries and the Irin Chronicles.